Back to a normal schedule for posting this week, thank the gods! Have a lot on deck, tweaking out a stuffed french toast bake thing that in its first inception was pretty good but not perfect, a follow up to the healthier ranch with a healthier bleu cheese dressing and there is an idea for vegetarian zucchini cakes that is knocking around in my head. And I want to do some baking… Can you tell I missed my kitchen last week? I love a steak dinner as much as the next person, but I don’t always want to dump $40 on good steaks to make that happen. Thankfully I don’t have to. Getting familiar with some of the more economical, and generally leaner, cuts of meat means being able to make fun steak dinners that won’t break the budget. I also like the cheaper quick cooking cuts for their flavor potential. I wouldn’t use some crazy marinade on a filet mignon, I pay that much per pound I want to appreciate it for what it is, but something like a flank steak…why not? Let’s talk meat – The parts of animals we eat are the muscles, which, when you think about it, is a chunk of knowledge that makes picking and choosing the “right” meat for the recipe a bit easier. Muscles on animals work exactly the same way as muscles on humans – the more you work them the leaner and tougher they get. Where as this is exactly what you want when you are running on a treadmill, this is far from desirable when we are talking about food. The cuts that are generally associated with “steak” – the filets, sirloins, strip, ribeye, etc – all come from the rib, short loin & sirloin areas. These are all behind the shoulder and in front of the rump, mainly centered up high on the animal. These are the muscle groups that are worked the least during day-to-day exercise, have the highest amount of marbling and are the most tender, hence they cost the most and are used as steaks. 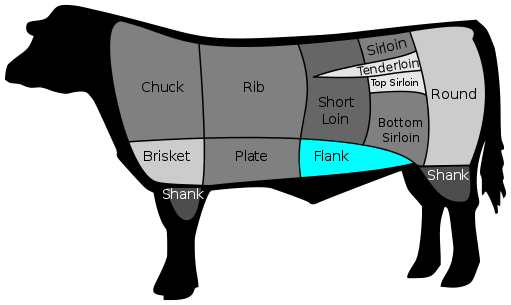 Other cuts that are heavier on connective tissue come from this area as well – short ribs, ribs – that require low & slow cooking, but mainly this is where the fatty yummy steaks come from. The shoulder & rump areas give cuts that are heavy on the connective tissue & fat, which may sound kind of gross, but that is the stuff that melts into liquid heaven when it is cooked for long periods of time. Think smoked beef brisket, pot roast, beef stew meat, etc. These are best when cooked low & slow, some with dry heat, some with moist, dependent on the cut. These are some of the most economical to buy and I see them quite often sold as “steaks” at the butcher counter – eye of round steaks, chuck steaks, shoulder steaks – but would never use them like that. You can marinade them for a day and then grill like a steak, but it really isn’t worth the effort when you have other options that won’t eat like a marinated super ball and the cost increase is minimal. Lesson #1 ~ There really is no such thing as a ridiculously cheap steak that is worth eating. Lesson #2 ~ there is more to being a steak than just shape. For our dinner we need to enter into the belly of the beast, literally – the plate & flank. These muscles are much leaner and a little tougher than the fatty steak cuts but have great flavor. The plate gives us skirt steak – this is a really thin and lean cut from the diaphragm muscle that is actually quite hard to cook well and requires a lot of trimming. It is used mainly in fajita-like preparations with flavorful marinades cooked quickly over high heat. It’s been making appearances on restaurant and taqueria menus all over the place. It is yummy but kind of a pain to work with unless you buy it trimmed, there is a pain in the dupa membrane that has to be removed. Skirt steak I will order when I am out; I have no issue paying someone else to play with that one for me. Flank steak is one of those cuts thats gets tragically overlooked mainly, I think, because it looks kind of weird & folks aren’t sure what to do with it. It is a long, flat piece of meat that looks kind of stringy when raw. It’s lean compared to the other steak cuts and priced well below the good steaks. It is a flavorful cut all by itself, but takes on all kinds of marinades with no issues at all and can be used is dishes as simple as tacos and as fancy as sliced with stock reduction sauce; I love that flexibility, especially at that price point. That said there are some rules to flank (or skirt, really) steak that must be adhered to to make it more than just edible. It is tougher than a strip steak; there is really not much that can be done about that, but there is much you can do to work around that. Use bold flavors and/or acids when marinating. I am generally a purist, sea salt & black pepper ONLY on a good steak, but this cut can take it and kind of needs it to help tenderize it. Flank steak can go for a good a soak. Heavy acids may start to cook it a little sous vide style, but under 36 hours and it isn’t a detriment. Even if you want to keep it simple a couple hours in salt, pepper, olive oil & lime will do wonders for the end result. For this recipe I gave it a marinade to inject some flavor to the meat then dry rubbed for a delicious charred crust. Always cook over high heat. Always. On average a flank steak is less than 1″ thick at its thickest. You really do not want to cook this over medium, it is so needlessly tough when you do, so you want to cook it fast, caramelizing the outside while quickly cooking it to medium rare – about 4-5 minutes per side – is ideal. Cut against the grain. This is a rule for ALL whole muscle meat cuts, not just this one. Ya know how when you are sanding wood you dont want to sand across the grain because it roughs up the natural grain of the wood? Cutting meat is the exact opposite – find the grain of the muscle you are dealing with and cut across it. Ever have a rueben where the corned beef was tough and hard to chew? That was more than likely because someone sliced it wrong. You need to break up stringy muscle fibers, cutting against the grain does this, cutting with the grain basically makes meat rope. No one wants to gnaw on meat rope. Well no one I want to feed anyway. Slice THIN. You don’t need it to be shaved lunch meat thin, but if you lay the flank steak on your board after it has rested, use a meat slicer or french knife, hold the blade at a 45 degree angle against the end of the steak and work your way back at about 1/4″ thick slices you will end up with perfect bias sliced pieces of medium-rare to medium steak that will not be tough or chewy. Relatively simple, really. I started this the night before in a silly easy marinade just to get some flavor into the meat, made a dry spice rub to coat the outside with right before grilling, cooked it to medium rare, let it rest and sliced it for a perfect steak. Total prep & cook time for the whole meal was less than an hour & a half…not bad for a big fat dinner! Portion wise your average flank steak is on the plus side of a pound, I usually use 1 whole flank steak for 2 people & this recipe is for one whole flank steak, adjust the recipe accordingly for your crew! Trim up the flank steak if it needs it, they rarely do when I have bought them from the butcher. Place all of the marinade ingredients in a gallon plastic baggie and smoosh together. Add the steak and smoosh some more, squeeze out all the air and seal the bag. Put it in a container (in case it leaks) in the fridge, squish around every once in awhile. This can be done up to 48 hours in advance, 12-18 is ideal. I do it up before bed the night before usually. Crushed red pepper flakes are good in there, too, but get HAWT in the marinade, esp if you’re a big baby like me. Mix all of the rub ingredients together until completely combined – I use a fork or a whisk to do it. Get the grill heated up, you want medium high heat for this. Take the steak out of the marinade and wipe it all off, it doesn’t need to be totally dry, but you don’t want it drippy wet. I use a flexible mat cutting board and put down about 1/3 of the rub in a layer the size of the steak and push the steak on top of it. Coat the top with the rub and rub it in all over. You want to get a nice dryish coating all over the entire steak; you shouldn’t have any rub left, it should all be on the steak. Get it on the grill quick – the rub will get sloppy wet pretty fast, you want it on the grill before that happens so it can sticks on like a crust while it sears. Turn it once to create cross hatch marks on both sides, but only grill for about 4-5 minutes per side total. When done remove to a platter, tent with foil and let rest for 5-10 minutes before slicing as per the instructions above. Not feeling the flank steak? Also really good with any steak cut – you just dont have to slice before serving or marinate if you dont want to, flat iron steaks – a newer to the market steak from under the shoulder blade that is more tender than a flank, but still a tougher cut that is best served marinated & sliced or skirt steak if you want to, just cook for far less time over higher heat to get a really nice sear. This doesn’t need a sauce, the dry rub makes a kind of chewy bbq-saucy thing while it cooks that keeps the meat nice and juicy. This is also amazing on a sandwich with some pickled radishes, greens and mustard or folded into a flour tortilla with some salsa and cilantro. Steak dinner that won’t bust your budget, looks fancy & tastes amazing. Get to grilling!